Berm homes were originally designed as a solution to the energy crisis in the 1970’s. This type of house plan is one of the most energy efficient homes you can build. Three sides of this home are literally tucked into the earth taking better advantage of the steady temperatures the soil provides. During the summer and in warmer climates, berm homes use less energy to maintain a cool temperature. The same is true for the winter and also a colder climate, berm style homes use less energy to stay warm. For something eco-friendly, unique and excellent for conserving energy, look no further than berm house plans for the best energy efficient homes. The Perla Florida Sunbelt Home has 4 bedrooms, 3 full baths and 1 half bath. 2631 Sq. Ft., Width 51'-0", Depth 67'-8"
The has 2 bedrooms, 2 full baths and 1 half bath. 3062 Sq. Ft., Width 72'-4", Depth 62'-4"
The Stonehaven Berm Home has 2 bedrooms and 2 full baths. 1480 Sq. Ft., Width 70'-0", Depth 36'-0"
The Woodhaven Vacation Home has 1 bedroom and 1 full bath. 809 Sq. Ft., Width 36'-8", Depth 30'-4"
The Grandale Berm Home has 3 bedrooms, 2 full baths and 1 half bath. 1643 Sq. Ft., Width 70'-3", Depth 28'-2"
The Eureka Berm Home has 2 bedrooms, 1 full bath and 1 half bath. 1105 Sq. Ft., Width 33'-0", Depth 35'-0"
The Greensaver Atrium Berm Home has 3 bedrooms and 2 full baths. 2163 Sq. Ft., Width 78'-8", Depth 54'-0"
The Skyliner A-Frame Vacation Home has 3 bedrooms and 2 full baths. 1806 Sq. Ft., Width 28'-0", Depth 40'-0"
The Crestbrook Berm Ranch Home has 3 bedrooms and 2 full baths. 1500 Sq. Ft., Width 50'-0", Depth 54'-0"
The Genes Cove Contemporary Home has 3 bedrooms and 2 full baths. 1421 Sq. 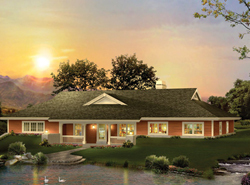 Ft., Width 69'-8", Depth 35'-8"
Our collection of house plans includes many berm home plans. We offer detailed floor plans that allow the buyer to visualize the look of the entire house, down to the smallest detail. With a wide variety of plans, we are sure that you will find the perfect house plan to fit your needs and style.